Cool. I love these classic old house features. Cabinet A today. Note the inexplicable upper doors from the 1950s. WHAT are they doing there? WHY are they there? This has always perplexed me. Last week it belatedly dawned on me: I have the original drawings! Whoee! So I looked at them, and the mystery of the ugly 1950s doors was explained! 1) The two upper drawers were removed. 2) The LONG upper doors were lowered, and their “double strength” glass replaced by thin plywood. The “open” space above the drawers was now a closed space. 3) Two new plywood doors were added on top. See? 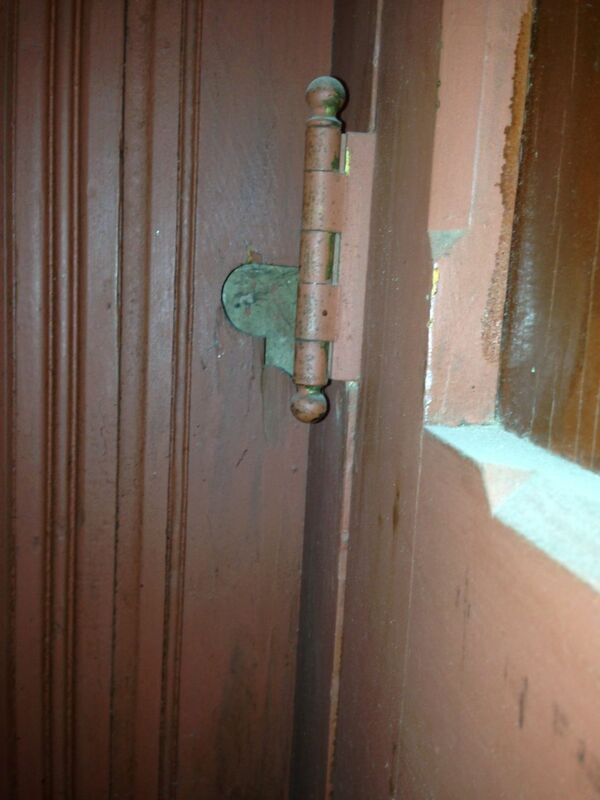 Just behind the hinge? It has been there all this time. I just was not looking! So, now I know the WHY of the ugly 1950s doors. And I now know how to recreate the original configuration. What is still a mystery is why the changes were made? I cannot see how anything was improved. Indeed, having the “open” space just above the drawers would have been handy. And two more drawers would have been better. Most curious. Now I need to have a séance in the house to call back the dead. An explanation is required! 8 Responses to The Dead Have Some Explaining To Do! Super cool! 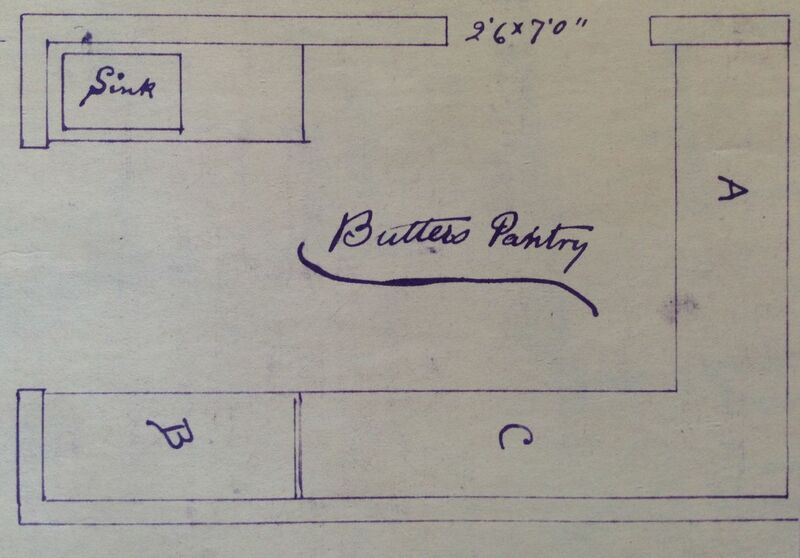 I covet butler’s pantries in these old homes. Very useful – especially if hosting a party! Perhaps past owner’s needed additional closed storage when operated as a motel? Is the rest of the pantry in decent condition? I can’t wait to see it restored and filled with great ‘stuff’! As always, thanks for sharing. Haha! I could use that headline for SO MANY questions. My thought was, if the Butler door was left open, the open space might be filled with unsightly clutter that one might not want to see when sitting in the formal dining room enjoying and elegant dinner with guests. Wasn’t the butler’s pantry where the glass, china, and linens were stored, along with the liquor? The open shelving was generally where the servants staged the service items for the meal — and the open shelving would have been perfect for that. It will be so cool to see it restored to its original configuration. Will you replace the plywood with glass? The plywood will be toast! The drawers in the current image are not original either, it appears all the original drawers were removed at some point. The original drawers were inset, with rectangular trim. The drawings are slightly deceiving. While I agree that they appear to show what you see, they are actually showing a curved edge detail. I agree with Jamie that the drawers that are there don’t look right. They look more like something from 1950 than 1894. Note that the finish matches the plywood inserts in the doors, not the frame. I’ll bet that the original drawers were repurposed for use in a more prominent place. Golly! My poor drawers are so controversial! The drawers are original. They match the drawings, and exactly match the drawers in the main pantry. The edge detail shown in the drawings is not a raised edge, but an “eased” edge, or rounded edge. The finish on the drawers, and the ugly 1950s doors, is paint, and is not original. The original finish was (and will be again) varnish. 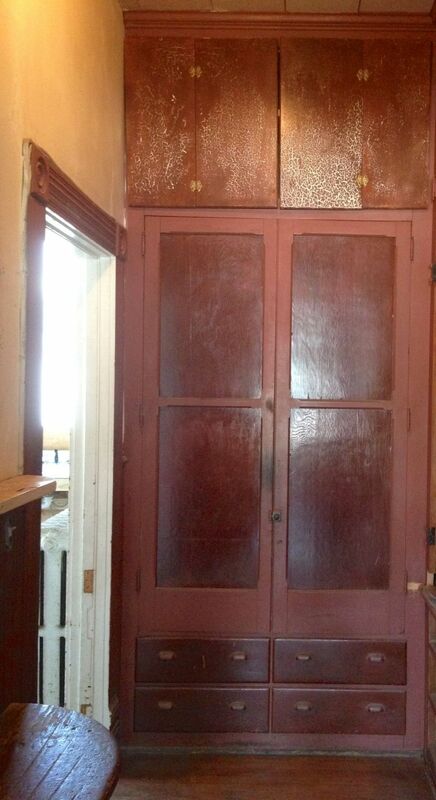 ALL the butler’s pantry cabinets were painted at some point in the two-tone finish seen in the images.